This has been gone over many times on this board. I'm not pretending that I am a particular expert. Our late member Ralph Stein was sure that the NY Philharmonic was the greatest orchestra in the world, as it should be, but it has long been known for its weaknesses. The last time I heard them was in fact with Ralph, and one of the things they performed was Schoenberg's Pelleas et Melisande (forgive me for not taking the time to put in the accents). There is a passage in that where the piccolo was so shrill it nearly drove me out of my seat. I have no doubt that all great orchestras have these kinds of problems, but the other side is that any world-class orchestra rises to the occasion when the occasion requires it. That's music, folks. Another issue is interpretation. I heard the Chicago Symphony under Solti at Wolsey Hall in New Haven, and they performed the Eroica. Now forgive me, but they skipped the repeat in the first verse. There is one strict rule with Beethoven, which Claudio Arrau once summarized nicely. In Beethoven, you never skip the repeats. It was a performance-ruining mistake by someone who was considered a great conductor leading a great orchestra. The situation with orchestras is often in flux and dependent upon a number of factors, not least conductor. So it is worth revisiting periodically. The Vienna Phil has too many unreconstructed Nazis for me to vote for them. When a Bernstein rehearsal of a Mahler symphony ended once, an orchestra member muttered, "Judische Schussmusik" (Jewish shitting music). If I could add a 7th, it would be the Czech Philharmonic. I don't think you mean Schussmusik (exit music), dear Rob, but I will not supply the correct alternative. Another problem with the Vienna Philharmonic was that they were among the last orchestras to allow women players. For centuries, it was assumed that only men could play in an orchestra, except perhaps for the harpist, which ironically excludes one of the very most difficult instruments. Years ago even my father said that women could not be ordinary military band members because they could not supply the wind. (At the time, the women in each major service had their own bands.) At the same time, a member of the West Point Band where he was the chief arranger tried out for a non-band instrument (unless you follow Frederic Fennel) which was the double bass. Guess which symphony orchestra hired him? Yep, Chicago. If you're talking about Bernstein you're talking about a quarter century ago. The present orchestra does not contain 'unreconstructed Nazis". Incidentally, they loved Bernstein and he returned that affection with very high regard for "the good professors". You might also be interested to know that until comparatively recently women were not allowed to sit with men in the Balkon Loge (upstairs). I was told this one night when sitting next to a woman in the Musikverein. She was bemused by it as was I. This wouldn't stop me loving either the Viennese or the Vienna Philharmonic for a single minute. They could stand on their heads and play music naked and I'd still go there. I'd even listen to or buy a Beethoven symphony conducted by Wilhelm Furtwängler who played in front of Hitler. If I were to choose my composers, musicians and conductors based upon impeccable moral credentials and standards I'd not only feel self-righteous but fall short in my list of suitable candidates. Depends on what you mean by "top orchestra." If it's "best orchestra," that's no more than a matter of personal opinion. My list, if I made one which I won't, would include the Vienna Philharmonic because alone among the world's major orchestras, it has a distinctive style and sound of its own which it consciously and determinedly preserves and can be identified by ear (unless a conductor has managed to suppress it). A more objective measure would be the orchestra's annual budget, which is usually related to its activity and the quality of its players. Add the Cleveland to this list and the other one. In this year's New Year's concert from Vienna, I saw three female players (not including the harp), so I think that door has finally opened. Unfortunately, I'm not fond of Vienna's Bruckner (Giulini) or Mahler (even those led by Bernstein). While they follow these conductors very clearly, the brass sound shallow to my ears, and the strings lack the weight that other orchestras can bring to this music. Their high tuning doesn't help. Also, Vienna follows its own beat, which is behind the conductor, an old tradition. I recently saw Zubin Mehta struggle with the Grieg piano concerto during a summer concert: the soloist would come in on the beat with his chord, while the orchestra was invariably behind. Frustrating, to say the least! Another example would be Mehta's recording of Mahler II, which shows ragged discipline in entrances that would drive me mad. Solti didn't tolerate that kind of nonsense, and his Ring recording shows great discipline and playing in general, as does his take on the Schumann Symphonies, my favorite. HVK had his troubles there as well: he worked hard to unite them, and his discs show they could be managed by a strong disciplinarian. He didn't last, as we know. Thus, an uneven ensemble, IMHO. If I could have an alternate choice, it would be the MET orchestra as it is now. My list is based on both live experiences and recordings. I've only heard Leningrad once live (in Carnegie Hall w/Mravinsky), and they were awesome, especially the refined, transparent strings. They certainly belong on that list somewhere, but the Russian recordings I have leave something to be desired sound-wise, thus it's hard to judge. St. Petersberg produces some fine musicians: two of my pianists in my competition were from there. The Czech Philharmonic has a beautiful sound in its own national music, but I'm not impressed by their Mahler, for example. I agree with you that the Leipzig Gewandhaus is a fine group, as is the Concertgebouw, which I know very little about. What recordings of the Concertgebouw would you recommend? Ranking orchestras is such a futile and subjective thing . Asking which is the "best" is like asking which would cuisine is the best ? Chinese? French? Italian ? Japanese ? The Vienna Philharmonic can be difficult for some conductors to manage, but when it's at its best , you can't beat them ! I remember a Bruckner 7th with them conducted by Abbado in Carnegie hall years ago . They played like the gods ! The audience cheers were so loud they were deafening ! As you can see, they're playing on Karajan's beat, not behind it, if that matters. RebLem wrote: The Vienna Phil has too many unreconstructed Nazis for me to vote for them. That's absurd. Nobody now in that orchestra was yet born before the fall of the Nazis. And I hope we're talking about the quality of orchestras' playing, not the politics of some of the players. If some are antisemites, most loved playing for Bernstein. For all I know, there may still be unreconstructed Stalinists in the St. Petersburg Philharmonic, previously the Leningrad Philharmonic, but so what? What the players think and even what they do between performances is no concern of mine. Bravo to your last paragraph. And I started the discussion because I wanted to know people's thoughts about orchestras because of the vast music collections and experience you all have. It's an interesting discussion - or was meant to be - and not a poll!!! In my own case it was the experience of hearing most of the world's 'great' orchestras and being intrigued about what makes an orchestra 'great'. Perhaps I should re-evaluate my position on the VPO. I have not until now for several reasons. I do know that no one who was in the orchestra before the surrender of Germany in WWII is still in the orchestra, of course. But it appears that some (I know not how many) are still sympathetic to that cause. I also love Wilhelm Furtwangler. Why? The short and simple answer is anyone who is good enough for Yehudi Menuhin is good enough for me. I own the following recordings of the Beethoven Ninth by Furtwanger. 1. 1 MAY 1937 BPO, London, while on tour, but done in a studio (74'22) with Erna Berger, soprano, Gertrude Pitzinger, contralto, Walther Ludwig, tenor, and Rudolf Watzke, bass. 2. 22 MAR 1942 BPO (73'12) live in Berlin. Tilla Briem, soprano, Elisabeth Hongen, contralto, Peter Anders, tenor, Rudolf Watzke, bass. 3. 19 APR 1942, BPO (71'41) live in Berlin. Same singers as in the 1937 recording except that the tenor is Helge Rosvaenge. 4. 8 DEC 1943, Stockholm Phil (73'28), in Stockholm, ​Hjördis Gunborg Schymberg, soprano, Lisa Tunnel, contralto (? ), Gosta Backelin, tenor, ​Sigurd Björling, baritone. I have been unable to determine whether Lisa Tunnel was a mezzo or a contralto. Wikipedia has no article on her. I found a picture of her online with Furtwangler and the other soloists here, but no description of her voice. 8 DEC is the date on the Archipel CD I have, but some sources indicate it was from 9 DEC.
6. 3 FEB 1952, Vienna Phil. (75'41). Hilde Guden, soprano, "Rosette" Anday, mezzo, Julius Patzak, tenor, Alfred Poell, baritone. It should be noted that Anday was Hungarian and her original name was Piroska Anday, but for professional reasons, she had to Germanize her first name. 7. 30 MAY 1953, Vienna Phil. (75'36). Irmgaard Seefried, soprano, "Rosette" Anday, contralto, Anton Dermota, tenor, Paul Schoffler, bass. Anday is described here as a contralto' her voice is not characterized in the previous recording I have listed. I took her description there as a Hungarian mezzo from the Wikipedia article on her. Ya pay yer money and ya take yer choice! I also have other recordings by people with execrable politics, prime among them Hermann Abendroth who conducted under the Nazis and when the Communists took over in East Germany, he seamlessly made his accommodations with the new regime. But individuals often feel alone. I am more critical of negative attitudes being tolerated in large organizations than I am about lone individuals with moral failings, because the former requires organization. I am also more tolerant of women (like Elisabeth Scharzkopf, one a Nazi Party member) because women are socialized in nearly all societies to go with the flow. It should not be, but fact is, its pretty much universal. Belle wrote: In my own case it was the experience of hearing most of the world's 'great' orchestras and being intrigued about what makes an orchestra 'great'. An interesting topic for discussion. Here are a few possible reasons, in no particular order. Money. Hiring the best players, often away from other orchestras that want to keep them, doesn't come cheap. It doesn't matter whether the money comes from government or private sources, but there has to be plenty of it. Working for years and in depth with a committed music director who's an outstanding orchestra builder - viz. the Amsterdam Concertgebouw Orchestra and the New York Philharmonic under Willem Mengelberg, and the Metropolitan Opera Orchestra under James Levine. A powerful tradition determinedly maintained - viz. the Vienna Philharmonic. A knowledgeable and responsive public. These are usually found in the great cities: Vienna, Berlin, New York, London, Moscow, St. Petersburg. There are great cities but no great concert orchestras in France or Italy and I believe there never have been - I wonder why. 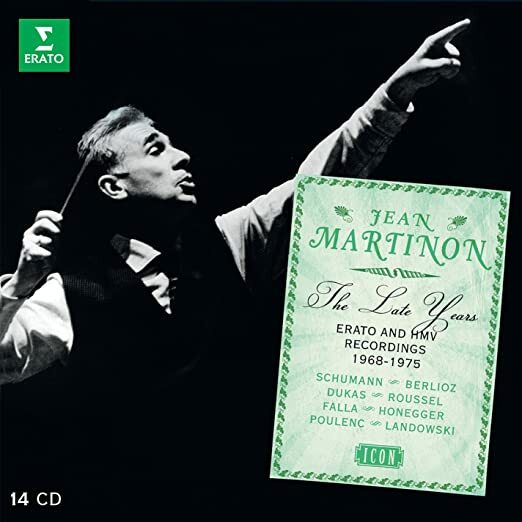 As for the French orchestras, I'm just now going through the above box, which contains all of Martinon's recordings with the French National Radio Orchestra, all of which are quite good. The only flaw I have found so far is some uncertainty in the opening measures of the Saint-Saens Organ Symphony (tough stuff for the wind players! 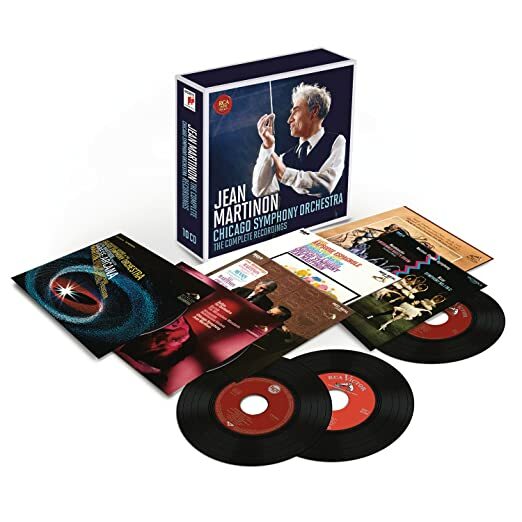 ), and I should point out that Martinon's only excursions away from French repertoire in this 14-disc set are the Brahms Tragic Overture, Bartok's Miraculous Mandarin, and Tchaikovsky's Piano Concerto II. Martinon obviously didn't want to take the orchestra much out of its comfort zone. He proved to be a conductor of international stature in Chicago (I have an outstanding Mahler III on a private collection issued by the orchestra), and his repertoire recorded commercially with that orchestra shows much breadth and depth. Thus, I rate the ORTF highly, but agree with you that French orchestras haven't done well in the great German and Russian symphonies, probably for political reasons. They certainly handle their own national repertoire well, however. Thanks so much for steering this in the direction I intended originally!! Your comments are apposite, particularly with regard to audiences; I think these and the critics are responsible, in many respects, for keeping the orchestra 'on its toes'. And I agree about French orchestras; I saw the Orchestra of Paris in Vienna in 2011 (Konzerthaus) and wondered why it didn't move me as I felt it should. I was speaking with a friend comparatively recently who is in our music group. She asked me this question about the world's top orchestras and what made them great; I was rather stuck for an answer, at first. I used the example of the Sydney Symphony Orchestra being a fine one but not up to the level of the top European orchestras. She said to me, "why? Can they improve?". I smiled at this question but simply said what you did about top conductors/music directors and an orchestra's constant exposure to these and the influence it has. Apart from those generalities, for me it's about the sound of the strings as a body and the playing of the principals in all sections. I'm less concerned with such matters as versatility and sheer virtuosity, but for others these may be more important. Re: additions. I only have one recording by the Sydney Symphony, and that is a Beethoven Missa Solemnis under Charles Mackerras, which I found very disappointing. I attribute its defects to the orchestra, and perhaps the recording engineers as Mackerras is a favorite conductor of mine--especially in Handel's Messiah, his two sets of the Beethoven symphonies, and his Janacek. I also own the Gerard Willems set of the Beethoven piano sonatas and concerti plus other works for solo piano with something called the Sinfonia Australis conducted by Anthony Walker on ABC Classics. It appears to be a pickup orchestra? Is it? Is it the Sydney Symphony in disguise? Its pretty good, but the principal purpose seems to be to present the Stuart & Sons 95 and 102 key superpianos to the public. Why Beethoven is the appropriate composer for this demo is another question. My personal favorite Australian orchestra is the Adelaide Symphony. I own a number of Arvo Volmer issues with that orchestra, including his set of the Sibelius symphonies, which is excellent, and another single CD of trombone concerti by various composers. In fact, the Adelaide Symphony is on my list of the ten most underrated orchestras in the world. I have posted here on that subject in the past. You might want to do a search if you missed it. Oh, btw, others have mentioned the Cleveland Orchestra among their favorites. While George Szell was alive and under the conductorships of Lorin Maazel and Pierre Boulez and perhaps even Christoph von Dohnanyi, I would have agreed, but no longer. Same with Philadelphia under Stokowski and Ormandy. And the same with the Chicago Symphony under Frederick Stock, Fritz Reiner, and Georg Solti. Too many people who do not know the history of the CSO think its Strauss tradition began with Solti. Some of the more knowledgeable might trace it back to Reiner. But the truth is that Theodore Thomas, the founder of the orchestra in the 1890's, went to Germany to select musicians for the orchestra, limiting his search to Strauss's students, which he had also been. In 1904, the CSO engaged its very first guest conductor who was--wait for it--Richard Strauss his own self. The CSO has been a Strauss orchestra from the very beginning. I think the CSO has been in decline since the death of Solti. But its been a slow and gradual decline, and the introduction of a new dynamic orchestra builder as music director could change it within 2-3 seasons. Its a long way from too far gone. You amaze me with your knowledge of Australian orchestras. Yes, that one you mention would have been a 'pick up' orchestra since I haven't heard of it myself. Vladimir Ashkenazy did good things with the SSO in his term but David Robertson (USA) is working with them now. I don't know how it's going as I never go to Sydney Opera House these days - which involves an 85 minute drive, 45 minutes in the train and a kilometer walk (in all weathers) from the rail station (through thumping disco music and imbibing 20 and 30-somethings, all talking at the tops of their voices in the venues lining the harbour en route to the august SOH; somebody thought this was a good idea; it wasn't!). So, I don't know if the orchestra is really up to snuff, as they say, these days. Friends tell me I'm missing out but they're quite happy with the local product where I'm much more fussy and choosy. That comes from living in Europe for a time, I expect. Oh, btw, others have mentioned the Cleveland Orchestra among their favorites. While George Szell was alive and under the conductorships of Lorin Maazel and Pierre Boulez and perhaps even Christoph von Dohnanyi, I would have agreed, but no longer. Same with Philadelphia under Stokowski and Ormandy. And the same with the Chicago Symphony under Frederick Stock, Fritz Reiner, and Georg Solti. Too many people who do not know the history of the CSO think its Strauss tradition began with Solti. Some of the more knowledgeable might trace it back to Reiner. But the truth is that Theodore Thomas, the founder of the orchestra in the 1890's, went to Germany to select musicians for the orchestra, limiting his search to Strauss's students, which he had also been. In 1904, the CSO engaged its very first guest conductor who was--wait for it--Richard Strauss his own self. The CSO has been a Strauss orchestra from the very beginning.I think the CSO has been in decline since the death of Solti. But its been a slow and gradual decline, and the introduction of a new dynamic orchestra builder as music director could change it within 2-3 seasons. Its a long way from too far gone. The above is all quite true. Like Cleveland with Welser-Most, Philadelphia declined under Eschenbach, yet according to what I'm hearing from friends in the Philadelphia area, they have experienced a Renaissance under Nezet-Seguin's leadership. When I posted my list, I was thinking about my library of recordings for the most part, not how the orchestras are performing today, where I have less expertise. The MET orchestra and the Philadelphia are the only two which have improved in recent years TMK. As a footnote, the Staatskapelle Berlin has issued some very fine Bruckner and Elgar in recent years with Barenboim. At a certain level, it's hard or impossible for a great orchestra to get better, however that is measured. But the arrival of just a few new principals can make a disproportionate difference - for example, Ricardo Morales's move from the Met orchestra to Philadelphia as principal clarinet. I heard the CSO in the Musikverein in 2011, with Muti - if I remember correctly. Unbelievable!!! I heard them play the Rite of Spring under Martinon. Shattered my cage. I had been nurtured on a transparent, central-European Cleveland Sound with a splash of Lenny here and there. This was from another world. "American". I loved it and have been a fan of this band ever since. The experience demonstrated to me that there's really very little between the world's best orchestras. The CSO was 'on fire'!! The LAPO (The Dude) was good too; I really enjoyed hearing them speaking to each other on the platform as I'd been without English speakers around me for the best part of a year. I was seated next to the first violins on each occasion. If you have not heard it already, I urge you to listen to Gustavo Dudamel's performance of the Mahler Resurrection @ the BBC Proms. The orchestra is the Simon Bolivar Orchestra from Venezuela, but the soloists and chorus are British. They go well together, and its actually one of the better Mahler 2's on YouTube. Well, thanks for posting that: I had not heard it before. Frankly, I found the performance embarrassing and exhilarating at the same time. Star though Dudamel may be, this over the top reading was frustrating to me in his use of tempo, while exhilarating in its passion in the final movement. 1) The tempo primo of the first movement was entirely too slow: it dragged from beginning to end, with rare exceptions. Totally unacceptable, even though the orchestra played beautifully. 2) The second movement tempo is supposed to be a landler, which is a folk dance. This movement plodded along as if held back by treacle, the most wrong tempo choice of the whole symphony. 3) Suddenly, we're back on track! III is played correctly, with just a tad of slowness here and there. 4) The "Urlicht" dragged a bit, but was lovingly sung. 5) The finale suddenly, for me, pulled into focus, as if Dudamel had an insight that he had been dragging the whole symphony, and a switch went off in his brain that Mahler's tempo markings were right after all. The chorus was magnificent, and the orchestra matched the sense of awe that the music is meant to convey. The explosive applause at the finish was well-deserved. This is the second time I've experienced Dudamel conducting Mahler (the first was his debut concert with the L. A. Philharmonic, which was televised), and both times I have been disappointed overall. Dudamel seems to relish extremes in this music, which may please some, but leave me quite unmoved. He still has a lot to learn IMHO. Thanks for posting this, RebLem. This is, however flawed, an important insight into Dudamel's thinking, which, however popular, I simply cannot agree with. Abbado's Lucerne DVD of this symphony remains my benchmark performance. We'll just have to agree to disagree. One thing I forgot to mention, but which you doubtless noticed in the video. Although he has a reputation as an enfant terrible, he uses divisi violins, a very old fashioned approach which I happen to like. ..or did you mean to only include orchestras as they are now, rather than as they were in the past? Surely NY & Philadelphia have made many great recordings in years past, even if they've fallen on hard times recently. For example, I refer to Ormandy's XXth Century repertoire in the early stereo era, and practically anything Bernstein recorded during his tenure in NY. Every major orchestra has made outstanding recordings at some time in its past, so I take Belle's topic to refer to orchestras as they are today. And since few major orchestras are making any recordings now, as things are in the classical record business, and most can't be heard in concert where any of us live, the answers would be based largely on reputation rather than actual experience. I'm sure Belle has her reasons for including the Royal Philharmonic in her top 5/6, as maestrob does for citing the Berlin State Opera Orchestra (if he has), but if I had to list the top 5 orchestras, neither would be in it. Actually, I do like the Berlin Staatskapelle very much in its recent recordings of Bruckner and Elgar with Barenboim, as well as in Suitner's recording of Pfitzner's "Palestrina," but I'll readily admit that this is not reason enough to put it on a Top V list. And yes, I am puzzled by seeing the Royal Philharmonic mentioned in the same breath as Berlin/Vienna & Chicago. I was referring to orchestras TODAY - meaning also within the last few years. Agree about the Staatskakpelle, Berlin, (which I saw/heard conducted by Barenboim) but I put only 6 in my list and it was hard to choose. In retrospect, I would probably have deleted the Royal Philharmonic and put instead the Leipzig Gewandhaus, which I have heard at least 3 times in concert - once in their own venue in that city. As I said earlier, there is very little between these wonderful orchestras when you hear them in the major works and they're on fire. The Royal Philharmonic seems to have been at its best during the years with Tennstedt, but they did impress me in the Konzerthaus (Dutoit/Yuja Wang) and I didn't think there was a discernible difference between them and the others I've mentioned. The Paris Orchestra failed to move me (Daniel Gatti). Then there are the smaller, 'period' ensembles - but I won't start that discussion. I'd say the Royal Philharmonic was at its best in the Beecham years, but of course that was long ago. Presently they aren't even the top orchestra in London; that would be the London Symphony Orchestra for sure. Of course that's just my opinion, confirmed by a recent performance here of Mahler's 10th symphony conducted by the new music director Simon Rattle.. Yes, of course, Beecham - but I was too young when he was around. PS, the NYPO's Mahler 9 under Haitink was pretty special - the occasion, the work, the conductor, the orchestra - the sum was larger than its parts.